It was one of the most extraordinary jam sessions in the history of rock’n’roll: Bruce Springsteen, Stevie Wonder, Simon & Garfunkel, Billie Joel, Crosby, Stills and Nash, Sting and James Taylor — to mention a few — on stage for five hours, playing some of the most iconic songs of modern times. The music extravaganza, at Madison Square Gardens, New York, was a celebration of the Rock and Roll Hall of Fame’s 25th anniversary, and featured a reunion of past inductees that had a roaring crowd on its feet well past midnight. The night’s emotional highlight came courtesy of Wonder, who broke down in tears as he sang Michael Jackson’s The Way You Make Me Feel in a tribute to the late singer, who died of a heart attack in June. One of the biggest roars came when Art Garfunkel and Paul Simon walked on stage, an ovation that only intensified after their rendition of their classic Bridge Over Troubled Water. Simon also performed the Beatles’ Here Comes the Sun — a song written by the late George Harrison — as a tribute to the star, whom he called “a man who I truly loved and admired greatly”. Eric Clapton was due to take part, but was forced to pull out after undergoing surgery to remove gallstones. His place was taken by Jeff Beck. The night also featured collaborations between a number of rock legends: Springsteen, who played for nearly two hours, joined Joel to sing New York State of Mind and Only the Good Die Young. “It’s been incredible being in a room with musicians . . . who put music in your head,” Springsteen said. The night ended with all the artists on stage performing Jackie Wilson’s (Your Love Keeps Lifting Me) Higher and Higher. Earlier, Wonder performed some of his most famous hits, including Living for the City and Superstition. He also gave the spotlight to the blues legend BB King — now 84 — who performed The Thrill Is Gone, while Smokey Robinson sang the Miracles’ classic The Tracks of My Tears. Some of the artists used the concert to celebrate an earlier generation of stars. Simon brought out Dion, and Little Anthony and the Imperials, while Springsteen showcased Sam Moore and John Fogerty. The concert was the first of two — last night U2, Aretha Franklin and Metallica were due to perform. The proceeds will help to fund the Rock and Roll Hall of Fame Foundation and Museum in Cleveland, Ohio. Even though the projects for Plan E 2009 are hardly finished, it is time to start thinking of work to be carried out with the money from Plan E 2010. Plan E is the government’s strategy to encourage employment and at the same time benefit every town and city in Spain. The amount that each town gets is related to its population. The idea is that the money is spent on new projects (not on completing existing projects) and that, as far as possible, the people used to do the work should come from the unemployed register. For 2009 Bigastro had a budget of 1,165,000 Euros, I don’t know how much the town is expecting for next year or what the projects might be. If they are as good as this year's, the town will look a lot better because of them. Officers from the National Police organised crime unit seized 160,000 fake Viagra tablets in raids on properties in Calpe recently. This is the biggest haul of the fake pills ever to be made in Spain. During the operation five people; two Spaniards, one Italian, one Venezuelan and an Iranian citizen were detained. Surely no hot blooded Spaniard would admit to having erection problems. In a new initiative, pupils at the schools in Bigastro will benefit from the presence of a Police Tutor. Whilst I was at Anfield, we had a community policeman attached to the school. He had a difficult role to play balancing familiarity with the pupils and respect for his position. It seemed that whenever we needed him, he was away on a course. Along with the two members of the police force In the picture are: the Councillor for Education, Mª Dolores Andreu; the Councillor for Citizen Security, Inmaculada Martínez, the Director of the San José de Calasanz School, Salomón Rivera and the Mayor of Bigastro, Raúl Valerio Medina. Easy to say in hindsight, but I've never performed a Windows upgrade and hopefully I never will. It's clean installs every time for me. and of course he is right. He should be; ICT his job and he is damn good at it. The temptation to upgrade rather than re-install comes from the fact that upgrade versions of Windows are cheaper and in theory an upgrade should save you hours of re-installing all your programs and data back once the new System is installed. When you think about it though, there are millions of different configurations of Windows depending on what software and peripheral hardware is installed . It would only take a dodgy driver for something as innocent as a pen drive to upset the upgrade process. All the pundits said that Windows 7 is the best thing since sliced bread but you knew that life would not be that simple. When XP was first launched, I bit the bullet and installed it only to revert back to the previous version of the operating system within a day. I currently have a stable working copy of Vista on my desktop and a fully functioning copy of XP on my netbook. VIsta may have given me a few headaches to start with but now it is well behaved. Just out of interest though I ran the Windows 7 compatibility check on my desktop. Whilst the hardware was all OK, there were some programs that I use that would need either updating or removing and re-installing following an upgrade. Many of my installed programs were not even mentioned. There was also uncertainty about my two printers. So for me an upgrade to Windows 7 is a big NO NO. My decision has been vindicated. It seems from the computer press that things are not going to plan for all the early takers of the new system. Microsoft is struggling to find answers for people whose attempt to upgrade to Windows 7 has sent their machine into an endless reboot cycle. Reports of the problem first began appearing on Microsoft's support forum on Friday, the day after the operating system was first released. According to the complaints, Windows 7 claims the upgrade has failed and that Vista will be restored. However, when the machine reboots it offers the same error and reboots again in an endless circle. Despite numerous reports of the problem, it seems Microsoft is still no closer to an answer and tempers are becoming frayed. Members of the British police force visited the Headquarters of the Local Police in Orihuela. They also paid visits to the National Police and the Guardia Civil in the city. It is all part of a plan ot promote friendship and international cooperation between the forces of the nine countries that are members of the International Police Association. You can find out more about it by visiting the web site at www.ipa-iac.org or www.ipa-uk.org. I am so glad that I handed back the school credit card to the Headteacher before leaving England; at least they won’t be after collaring me! The appointment that was, then wasn’t then was again. Pam registered with the oncologist at the local hospital for continued monitoring following her breast cancer nearly six years ago. After her first consultation, the oncologist decided he wanted a mammogram, a chest x-ray and a blood test to check the state of play before his next meeting with her. Pam got appointments for the blood test and the chest x-ray but needed to make one for the mammogram. No problem, a quick visit to the Vega Baja would sort that out and it did. Pam got a phone call the other day giving her an appointment for 8:30am this morning. Then within an hour she got a further call to say that it would not be possible to fit her in today. No problem, Pam doesn’t like early morning appointments anyway. Hopefully they would find a more civilised time to see her. That was not to be. This morning, I got up at 8am and was just scouring through the local papers to look for something to write on my blog when the phone rang. It was the lady from Vega Baja hospital who wanted to speak to Pam. Pam wasn’t awake at that ungodly hour and didn’t really want to have a conversation in Spanish but the lady insisted on speaking to her. It turned out that, in fact Pam could have a mammogram this morning and could she come straight away. A quick cup of tea later, we were in the car. As it turned out, we needn’t have rushed because it was over two hours later that Pam’s turn came to be seen. Fortunately, they were able to do the chest x-ray at the same time otherwise we would have had to return to the hospital this afternoon for that appointment. Two visits to the hospital in one day would have been too much. Tomorrow, Pam has an appointment at 8:40 for the blood test. That will be the second early morning on the trot for her which is not good! Thankfully this should only happen once a year so Pam will have time to recover. The war that has been going on between the leader of the PP party in Bigastro, Aurelio Murcia and his ex partner, Ginés Ruiz Sánchez continues. The one time friends and companions are now sworn enemies as a result of the crisis in the construction industry. The fact that they live opposite each other doesn't make matters easy. Murcia had his house on Calle Irlanda built by Star Sol whilst they were completing Villas Andrea. By anybody’s standards it is a luxury villa, on a prime plot, with uninterrupted views of the Vega Baja and the mountains beyond. When the partnership between the two became fraught, the question of ownership of the house was brought into question. A for sale sign was painted on the wall indicating that Ruiz, who I understand was the major partner in the company, had every intention of selling the property. Then on the 13th March 2008, under the direction of Ruiz, a truck removed the driveway gate to the house. In the process Murcia suffered an injury to his foot and so denounced Ruiz for assault. Ruiz says that Murcia must have mistook the people who removed the gate for thieves. He claimed they were removing the gate for repairs. The gate has subsequently been put back but has to be opened and closed by hand. On the 7th April, Ruiz denounced Murcia claiming that he was paying the mortgage of 1,300,000 € with a term up to 2026. On the 23rd May, Ruiz stopped making mortgage payments. Murcia has had to make the payments himself to prevent an embargo on the property. In the meantime, the electricity and water to the house were disconnected under the instructions of Ruiz who claimed to be paying the bills. Murcia managed to get the electricity reconnected only to find it cut off permanently a few days later. Murcia now has an electricity supply via a diesel generator. Yesterday, Ruiz denounced Murcia again, this time for illegal occupation and for misappropriation of furniture and fittings worth 149,282€ which were paid for by the company Star Sol. The house, which is claimed to be worth 2,000,000€ is owned by Andrea Villas, a subsidiary of Star Sol and had been gifted to Murcia. What happens next is anybody's guess. Nobody likes to visit the beach when there is a a barrier of seaweed between the sand and the sea. That is the problem that swimmers are complaining about on the beaches at Torrevieja. The summer temperatures we are experiencing at the moment and the fact that the sea is still warm means that people want to bathe and don’t want to wade through seaweed in the process. Normally the beaches are cleaned every day but the plan for this year was to leave them during the winter months to try and solve the problem of loosing sand. The hope was,that by leaving the seaweed on the beaches during the cold months of the year, they could protect them from the surges that occur during autumn and winter that wash the sand away. Seaweed also provides other beneficial effects: it oxygenates the sand and at the same time disinfects it with the iodine that it produces. Last Wednesday I passed on information from the town hall about the red weevil (picudo rojo) that is destroying palm trees here in Spain. It seems that one of our neighbours has encountered these nasty creatures in her garden. She described the weevil as largish, red and noisy. Concerned that the weevil would attack the palm trees in her garden, our neighbour visited the town hall to enquire about what to do. They directed her to a shop where she could buy the necessary insecticide which she has now done. Hopefully, her timely intervention will have prevented the weevil from laying its eggs and ultimately destroying her palm trees. To give you some idea of what to look for, here are a couple of photos showing the picudo rojo. The weevils range in size from between 2 and 5cm long and are about 1cm wide. The trees mostly affected are the Date palm (Phoenix dactylifera) and the Canary Island date palm (Phoenix canariensis) so if you have either of these trees it may be as well to follow the recommended treatments in Autumn and Spring to prevent the terminal damage the picudo rojo can inflict. Next year being the 100th centenary of the birth of the poet Miguel Hernandez, there have been moves to try and return his legacy of manuscripts, letters, books, photographs, paintings, personal press articles, records, pamphlets and other objects to Orihuela in preparation for the celebrations. The Hernandez collection has been in that care of Elche since 2002 under a seven year agreement with his family. They are kept at the Centro Hernandiano de Estudios e Investigación, created for this purpose in the Capilla de Orden Tercera de San José and an annexe. Elche has fulfilled its agreement to catalogue, digitise and create a research centre for the work of the poet but now the agreement has ended, the family of the poet want over two million Euros to allow Elche to keep the material. Orihuela has already indicated its willingness to make a bid and negotiations between the family and Elche to keep the work there are at a low point. Although Elche would like to retain the artefacts, that is a lot of money in these times of economic crisis. Yesterday was a beautiful day; clear blue skies, brilliant sunshine and warm without a breath of a breeze to mar it. Obviously a lot of people had the same idea; to take advantage of the weather and spend the day on the beach keeping the tan going. With all the holidaymakers well gone, these must have been residents. Most were Spanish with a smattering of Brits and Germans thrown in. The bad weather we had last month was just a blip. Now it is back to normal. Nice warm temperatures, a smattering of sun, a gently breeze and little chance of any rain to spoil the days. Having nothing better to do on a Sunday morning with an hour extra to search about, I found these blogs written by people from Bigastro. There may be others on services like Windows Live but I haven’t researched those yet. In fact there are others on BlogSpot but they had very little content so I haven’t included them. That more cars are stolen in the province of Alicante than anywhere else in Spain. Thirty eight cars a day are stolen from the public highways in the province – more than the number recorded in Madrid, Barcelona or Valencia. In 2008, courts in the province of Alicante dealt with nearly 14,000 cases involving vehicle theft – not only cars, but also lorries and motorbikes. Statistics show that one in six vehicles stolen in Spain will have been taken in Alicante. Last year almost 80,000 were stolen an increase of 39 per cent over the year before. This compares to a rise of just 5.4 per cent in Spain as a whole during the same period. There has also been a notable increase of thefts from inside cars. According to the association of Guardia Civil officers, the recession has been a major factor in the increase in car thefts. Most thefts of vehicles, or from inside vehicles, happen in large towns and cities, but police complain there is little they can do in the case of the latter. A theft valued at less than 400 Euros is classed as a ‘fault’ rather than a ‘crime’, meaning if the culprit is caught, he or she is immediately released. I’ve had my new camera now for over three weeks, enough time to learn how to use it and give it a fair trial. Moving from a consumer camera (Canon EOS 450D with the 18-55mm f4 – f5.6 IS kit lens) to a pro version (Canon EOS 5D MkII with the 24-105mm f4 L USM IS lens) you would expect to see a big difference and you can. The first noticeable difference is in size and weight but that is only the start. The 5D has a full frame sensor as opposed to the compact sensor of the 450D. The immediate benefit of that is a larger pixel count - 21.2 megapixels against 12.2 which to be fair is almost irrelevant when you are only printing up to A4.The real bonus is that you can use the 5D in low light and not get digital noise. Actually the 450D's sensor is very good up to 800ASA and even useable at 1600ASA. However, the 5D can go up to 3200ASA and produce the same clean results as the 450D at about 400ASA. That is a huge bonus as is the larger and much brighter viewfinder. However it is when you compare the two lenses that the differences really start to show in terms of image quality. The pro series L lens has USM which stands for ultrasonic motor. That makes it focuses much faster and in virtual silence. Both lenses have IS which means that they compensate for image movement at slower shutter speeds. Apart from those features, the L series lens is just that much sharper throughout its range. I can blow pictures taken with it up to pixel size and still see the sharpness even when the lens is used at full aperture. Now to the bonus. The 5D takes high definition movies. Although it is no substitute for a dedicated camcorder, the results are just stunning. For those occasions when you are taking stills and just want a short movie clip it is perfect. You can even take still photographs at the same time as movies. I haven’t tried that yet but will when my grandchild is born in February. Call me spoilt because I also have a new netbook computer to play with. I admit now that cost saving on the Acer Aspire One was a bit of a mistake. It came with a lot of compromises that were becoming hard to live with. Surprisingly it wasn’t the open source Linux software that caused the most problems although it did impose certain limitations. It was more the fact that the machine ran so slow whenever you gave it a difficult task to perform. Damn it, the Acer was even tardy on some routine tasks. I never expected it to rival my desktop machine but I did think it would be faster than my ten year old Dell laptop and it wasn’t. So Pam now has the Acer and finds it a lot easier to get around than my desktop and I have one of the ubiquitous Samsung NC10s. First off the Samsung has a slightly larger screen but more important a larger keyboard. It isn’t that the Aspire keyboard was bad, it is just that this one is better for my manly fingers. Inside though is where the real differences become apparent. The Samsung runs Windows XP which is a more familiar environment for me. It means that I can use all the programs I am used to including my favourite email client Thunderbird. The Vodafone USB dongle I bought works on it and I can even connect my new Canon camera using Canon EOS Utility to download images which can be processed in Digital Photo Professional. Did I mention the battery life? The Acer came with a 3 cell battery which last about 2 to 3 hours before it dies. The Samsung has a 6 cell battery which seems to last an amazing six hours or more. Oh yes and the wireless connection is almost instantaneous with the Samsung. The lesson I have learnt from all this is is buy cheap and replace more often. Still the Samsung wasn’t available when I got the Acer so there wasn’t that choice at the time and the 5D was on Mk1 which had far less features. The taxi drivers of Torrevieja have been protesting lately about the number of unlicensed cabs that are operating in the area. Their main complaint is about the cabs that operate between Alicante airport and the town although they claim that illegal operators are now picking up at health centres, the hospital etc. The drivers hope to have 150 taxis join their protest, most from Torrevieja supported by other from Orihuela and Elche. They aim to meet on Calle Orihuela at the corner of Caballero de Rodas and then move on. That sounds like a great trip; a museum of wine and two bodegas – there is bound to be some serious sampling going on. The Progressive Women of Bigastro sure know how to live! At 40€ a piece which doesn’t include the cost of the coach, I reckon lunch could be a real treat as well. Jorge Hernandez is the winner of the competition for the best photograph from “the Footpath of the Poet” with this picture entitled “Hernandiana Ascent”. Each year about 2,000 people walk the route from Orihuela to Elche and obviously this presents some great photo opportunities for the participants. The winning photographs will be exhibited in the towns along the route. In the meantime Jorge has scooped the 1,500 prize for his effort. Although I would have loved to have taken that photo, I would not have enjoyed climbing up that hill to get it. Getting those pictures of the huerta yesterday was enough of an effort for me. When I set off along the road from the roundabout to the river it was a pleasant warm day following the early morning downpour. By the time I reached the canal, the wind was blowing strong into my face. When I got back home to process the results, the gusts were reaching gale force turning a few pots over in our garden. According to the PP party, as many as 250 home owners in Bigastro have not received a bill for their council tax in 20 years. They say that these properties comprise both apartments in the town centre and villas in the outskirts of town. Whenever their inquisitive owners approached the town hall and asked why they had not been given their annual IBI bill to pay their compulsory asset tax on their homes, they were told ‘not to worry about it’, claims PP spokesman Aurelio Murcia. However, If a catastral, or land value, review were carried out, the homeowners in question would receive a bill for this year and for the previous four years – not a pleasant prospect. I can categorically confirm that we have paid IBI tax on our property. This panoramic shot, which is actually four pictures stitched together, shows the mountain vista that you see from the huerta. The huerta is the kitchen garden for the area. Much of it is planted out with citrus trees although there are also palm groves, the odd olive tree and fields of vegetables as well. The area depends upon an irrigation system which is Arabic in origin. A series of sluice gates direct the water from the main canals along to the areas of planting. The pound rose almost two cents against the dollar to a near six-week high of $1.6622, and almost a cent higher against the euro at €1.1081, the highest level in four weeks. The rise was partly explained by minutes from the Bank of England, which showed the Monetary Policy Committee voted 9-0 in favour of holding interest rates at 0.5pc, and to leave its quantitative easing target unchanged at £175bn. There is a long way to go before we reach the dizzy heights that the pound held against the Euro previously. I’ve heard of people who bought their property here when the exchange rate was 1.67€ to the pound*. We weren’t so lucky but did see a rate of 1.52€ to the pound when my pension was first transferred to Spain. Still we mustn't complain, an extra few Euros each month as the rate improves makes all the difference. * Just imagine what sort of property we could have bought then. Not only was the exchange rate much better than when we bought but prices were a lot lower as well. The hospital at Torrevieja has been recognised by Microsoft as having the most successful implementation of the IT giant’s tools for managing costs and efficiency. The system at Torrevieja goes well beyond the recording systems at other public hospitals. All parties concerned; relative, doctors and managers can interact with the clinical history of the patient. From the moment a patient enters the hospital, the system monitors their progress. If a patient is not dealt with in the recommended time, the manager responsible receives an SMS. Similar messages are sent to the doctor when the results of tests are available and to relatives following work in the operating theatre. Microsoft make this award on an annual basis to the project which they judge to maximise efficiency and reduce costs. For the hospital at Torrevieja to be judged as having produced the best IT solution world wide is a great honour. I don’t want to rain on their parade but last week when I went down there to sort out my appointment, the lady in reception was complaining that the computer system was very slow and had in fact just crashed and rebooted. If you are reading this blog, then you already using an internet connection. If you live in Bigastro and are reading this in an Internet cafe or in the municipal library this may be of interest to you. The Bigastro council have started a new advertising campaign to promote access to Internet via it service Bigastel. Just to remind you, Bigastel is a Wi-FI service i.e. internet without cables which is available at a very good price via the municipal company Bigastel. What you get is an internet connection up to 3Mb, a phone without line rental and without call charges to other Bigastel users. The Council of Health and Environment inform us that some of the palm trees in the town have been infected by the picudo rojo. The insects fly into the palms attracted by the scent of pruning. Once there, they lay their eggs in the leaves. The larvae, which are about 4 –6cm long, eat the young leaves which eventually causes the tree to die. Any trees which are affected must be cut down, crushed and burnt. in 1 litre of water). The PP party in Bigastro claim that the car park which is located in the basement of the Auditorium is neither licensed nor is it covered by an insurance policy. They have therefore requested that it is closed. The spokesperson for the PP, Aurelio Murcia, says that they had asked on several occasions about the license and the insurance for the parking and eventually took the matter to court. Only then when directed by a judge, did the mayor, Raul Valerio Medina, admit that neither document existed. At present the car parking is only used by municipal vehicles and nine individuals but that is not the point. As Murcia explains, in the case of a fire or a flood or any other accident, the council would not be covered for any loss or damage. Have you noticed, as soon as your plane touches down and comes to a halt; out come the mobile phones. It is as if those few hours without communication have been utterly unbearable and amends must be made straight away. After all, there may have been an important message whilst we were in the air which must be retrieved without delay and of course it is imperative that folks announce their arrival as soon as possible. Passengers bound for Newcastle Airport from Murcia came unstuck though when their plane was partially dismantled because a mobile phone which had been switched on fell into an air vent. The Jet2 flight had just landed at Murcia when a traveller dropped the phone, which slid out of sight. As it had been turned on, airline bosses refused to allow the plane to take off until it was located. Holidaymakers were delayed for three hours while the cockpit area and front row of seats was taken apart. A spokesman for Jet2.com thanked the passengers for their patience during the incident on Sunday. He said: "We always operate to the highest standards of safety and care and whilst it was no doubt inconvenient that people had to wait for us to retrieve the phone, any mobile or similar communications device that is switched on would need to be removed from the aircraft in order to ensure maximum safety for our passengers. "We would like to remind all those travelling by air not to switch their phones on until they reach the airport terminal." Repeat: DO NOT SWITCH ON YOUR PHONE UNTIL YOU REACH THE TERMINAL BUILDING. Those few minutes of delay could save passengers on the flight back a long delay. I’m sorry but I just cannot take the game of football seriously. In my opinion, the ludicrous transfer fees and the antics of some of the fans just beggars belief. This latest story just confirms my feelings for the “beautiful game”. Liverpool football club have sold out of the £10 "Beach Set" and will search Manchester United supporters for any offending items, including beach balls, before Sunday's Premier League clash at Anfield. The club's online store has experienced a rush on the "Beach Set" package following Darren Bent's winning goal at Sunderland on Saturday, when his shot struck a Liverpool-crested beach ball and ricocheted beyond goalkeeper José Reina. United supporters are suspected of being behind the increased demand for Liverpool beach products, with a "tribute" to Bent's goal planned but risk having them confiscated at the turnstiles on Sunday. "It will be the normal search policy," said a Liverpool spokesperson. Rafael Benítez, who refused to use Bent's goal as an excuse for Liverpool's fourth league defeat of the season, has no intention of asking for the Sunderland match to be replayed. Precedent exists for replaying matches when a referee has erred over a goal but the Liverpool manager said: "A lot of people are saying this but we will not be asking for a replay." We Brits do have a bit of a reputation to live down. Our Spanish teacher told us yesterday that the impression many Spaniards have is of a nation of fat drunks. To be fair, the British press does paint a bad picture of binge drinkers and a visit to the English bars on the costas confirms that many of us are fond of a beer or two. However, we are hardly a nation of drunks and our teacher was pleased to find that we actually pursued hobbies other than drinking and that some actually work hard to keep themselves fit. In Cataluña they have recognised the problem of excessive drinking and have banned the whole business of Happy Hours (two drinks for the price of one). Any bar or disco found flouting the ban faces a fine of between 3,000 and 600,000 Euros. Although the ban only applies to the Cataluña region at the moment, experts predict that other areas will soon follow suit. In fact this ban is not aimed specifically at Brits. It is the result of a study developed by Madrid-based distillers Diageo and the IESE Business School at Navarra University as part of their joint corporate responsibility strategy and calls special attention to the availability of alcohol to minors. The report concludes that the traditional Mediterranean pattern of drinking is being abandoned while less moderate "Nordic patterns" are emerging. "The new consumption habit which is developing between Spanish youths, including minors," it says, "is characterised by alcohol consumption associated with leisure and weekend, times when large amounts of alcohol, especially distilled spirits, are drunk." One of our neighbours came round the other day to deliver our Betterware order. I couldn’t help but notice the mosquito bites on his legs. The reaction he had suffered looked to be most unpleasant. Pam and I have a few bites to show for this latest attack but nothing to compare with those of our neighbour. In Torrevieja they have been spraying to eliminate the little biters but have faced the problem in gaining access to private land where the insects can breed in even the smallest puddle of water. Wouldn’t it be better if they could find a way to get rid of the insects all together? In San Fulgencio they have taken a more radical approach to the elimination of mosquitoes in the town. Last Thursday, a helicopter sprayed a biological larvicide which they claim will give permanent protection for a whole year. The chemical used is highly selective and will not harm any other insects or animals nor will it cause any damage to the environment. I wonder if it is possible that we can have a similar solution for our town? It might spare us a lot of misery and discomfort. In the 1980s Torrevieja had a population of 12,000. By 1990 the population had risen to 23,192 and by 2000 to 50,189. The latest figures from the padron show that the current recorded population is 103,265 a figure which is down by 1,435 from last year. Of the 117 nationalities that live in Torrevieja, Spaniards make up 46.78%. Brits represent the largest group of foreigners with 12,917 registered citizens. They are followed by the Germans with 3,817. The other major countries represented are Russia (3,353), Morocco (3,206), Sweden (2,784), Norway (2,213), Ukraine (2,213), Bulgaria (2,180), Romania (2,162), Colombia (2,139), Finland (1,200), Belgium (1,417) and Italy (1,095). The problem is that these figures only show those people registered on the padron. Estimates show that there are at least a further 60,000 unregistered residents that live in Torrevieja for the majority of the year. It is anybody's guess as to what nationality they are. The weather forecast for this week is not very inspiring until you consider the forecast for Manchester where we were a fortnight ago. The daytime temperatures about match the night temperatures here in Bigastro.At that point I will stop complaining about the weather here. You may have noticed a helicopter flying overhead when you have been out and about and wondered what it was doing. The helicopter you have seen may be the one that is being used by the Guardia Civil to spot marihuana plants being grown on terraces, balconies and patios. So far, as a result of this “spy in the sky” the police have made 18 arrests and confiscated 87 plants. The aim is not to stop the people who just have the odd plant growing for their own use even though that is illegal but to catch the ones who are growing to sell the drugs out on the streets. Cannabis users will argue that five or six plants would be needed to supply a user with sufficient weed for their own use. The police would argue differently. Of course the helicopter will spot a lot more than just illegal cannabis plants. You have been warned! You often hear small planes flying over the area and wonder what they are doing. We know that the little yellow plane is spraying insecticide but what about the others. Some fly very low and sound as though they are just about keeping up in the air. One of those light aircraft didn’t make it. The plane crashed into a tree at La Marquesa finca off the CV-940 near Los Montesinos on Wednesday afternoon. It was thought that the pilot was trying to land his plane. One witness said he saw the aircraft going up, it then turned and fell in a spiral to the ground. This is the second fatal plane crash in the area within two months. A 50 year old pilot and his 75 year old passenger were killed when their plane crashed at Pinar de Campoverde in August. The pilot, on this occasion, was flying low to allow his passenger to photograph houses. Just so long as they stay clear of my house, these people can fly wherever they want. The last thing I need is a plane crashed in my pool. For a colour version go to my Flickr album. The area of the Pedrera is a favourite spot for me to visit and take photographs. It is an area of natural beauty right on my doorstep. You might suppose that I'd get bored visiting the same place time and again. but I don't because changes of light and viewpoint constantly create new images for me to record. For these photographs, I chose to shoot in black and white. When I first started with photography, all my pictures were black and white. I developed the films and printed the negatives myself. There was a certain kind of magic about watching the image appear in the developer dish. In the world of digital photography, I can keep my hands clean, avoid the pungent smell of fixer and get the same results. Of course, my digital cameras record the world in colour but they also work in black and white. When you strip away colour from a landscape, all that is left are the textures and the tones. Recording in black and white makes me think about photography the way I used to do forty years ago - back to my roots as they say. When children in Britain were given concentrated orange juice and cod liver oil? In that case you are as old as us. Food rationing finished at midnight on 4 July 1954 and at the same time the supply of orange juice for infants. We did have free school milk. The Schools Milk Act, which was passed in 1946, provided one third of a pint of milk per day for all children up to the age of 18. In 1968, Harold Wilson stopped free milk for secondary school children. Then Margaret Thatcher’s Conservative Government stopped school milk for children over the age of seven in 1971. At that time, many councils tried to defy the instruction. Labour councils in particular threatened to put up rates to allow them to continue supplies of milk to children. The provision of free milk cost £14m per year which was twice as much as was spent on school books. It could be argued that children no longer needed free milk in schools because their parents could provide it. The problem is that, these days, some parents seem to have very little control over what their children drink and allow them to choose sugar laden carbonated drinks rather than fresh milk or fruit juice. Things are different in neighbouring Hurchillo where the council believe that children should still have fresh orange juice. In celebration of the Día Mundial de la Alimentación yesterday, they gave the children orange juice. I dare say the children enjoyed it and would welcome a glass of fresh juice every day. It would certainly be a lot better for them than a lot of the drinks they buy in cans. Whenever we meet our neighbours for a chat many will invariably insist on trying to discuss the programmess they have been watching on UK TV. When we explain to them that we don’t actually have UK TV in our house a look of incredulity comes over their faces. Although they don’t say it, you can see that they assume we must be barking mad to subscribe to Digital +, the Spanish satellite TV service. After all it isn’t cheap and most of the channels are exclusively in Spanish. Let me explain that we are not trying to prove how Spanish we have become. We took the decision to subscribe to Digital + following the advice of Cher who used to work in the estate office here at Villas Andrea. She had subscribed to the analogue microwave system only to be told that it was shutting down and she would have to change to the digital one. Then there were fears that the whole microwave system would close down and she would have to invest in a large dish to pick up Sky (there was no Freeview at that time). As Cher explained, every year it seemed that you had to fork out more and more Euros to change your dish our your receiver just to keep up. Apart from the expense, it was inconvenient. Channels that you received one day would mysteriously disappear the next. In order to receive her favourite soaps, Cher felt that she was entering into the world of subterfuge because she knew that there was no legal way anyone in Spain could watch them. Acting on Cher's advice, we took the bold step of subscribing to the service she had moved to – DIgital +. At first it wasn’t easy to find any content that we could watch. We came across the People and Arts channel that broadcast old BBC programmes. That kept us going for awhile. Gradually though we found other channels that had American and British content. AXN, for example, has a lot of programmes in English as does National Geographic, Discovery and VIajar. For news we found Euronews, France 24, BBC World etc. When Michael Jackson died we kept up with events via FOX News and CNN. Canal 1 shows current films most nights of the week that are broadcast simultaneously in Spanish and English. We even get major sporting events including European football games. In time, we started to watch more programs in Spanish and were pleased that we could follow them even if we didn’t understand all the dialogue. Listening to Spanish TV is probably the best way to improve your language skills. Do we miss British TV? Of course there are some of our favourites that we miss but they are probably all finished with anyway. We certainly don’t miss all that reality TV that was taking over broadcasting in the UK and we don’t miss all that channel hopping that we indulged in trying to find something worth watching. When we look back we realise that, in the UK, we would watch many programs for something to do. Now we increasingly watch programs because we want to watch them. Whilst we were happy to watch UK TV on our recent visit to the UK, we were glad to get back to our Spanish TV here in Bigastro. So if you see us in the street, please don’t ask us which of the contestants on Strictly Come Dancing will win or who is the most deserving entrant on X Factor because we won’t have a clue. Missing one hospital appointment was bad enough; missing two was almost inexcusable. This time though it definitely wasn’t my fault. I got a call before we left for England to say that, following my appointment at Torrevieja, I had an appointment this morning at Vega Baja. We arrived at Vega Baja in good time; just as well because I struggled to find somewhere to park. When I asked at the hospital’s reception desk, I was told my appointment was in the radiology department. However, at the radiology department, they had no record of my appointment so back to reception. This time, they decided that my appointment was actually at Torrevieja. Ah well, maybe I misunderstood the lady on the phone. A quick trip to Torrevieja was obviously required. We hotfooted down to the hospital at Torre only to be told there was no record of an appointment there. Cómo es extraño. I can only conclude that whoever phoned me hadn’t booked the appointment into the system. I will have to see what happens next. For the moment the photograph of my heart will have to wait. It seems that the newly installed fixed radar tracking system that is meant to help catch drug smugglers and illegal immigrants has experienced some teething problems. The four fixed radar stations along the Alicante coast which cost 8.3 million Euros to install failed to detect a zodiac inflatable in the first 24 hours of operation. The boat, which was found on the beach at Torrevieja, was thought to have carried several tonnes of marijuana. Last week five small boats, used to carry illegal immigrants were found on the Alicante coastline. These had also been missed my the new system. The company responsible for the installation are now carrying out extensive checks to find out why the system failed. In the meantime the Guardia Civil officers who worked the older mobile units have been recalled to work on the fixed radar stations in the hope that their experience will help improve the detection of suspect boats. It is claimed that early morning fog has made it difficult for the surveillance cameras to spot the boats. Now, I might be wrong, but I thought that was the point of using radar. PS I have a decent pair of binoculars I can lend them. The plague of mosquitoes that hit Torrevieja appeared on the national news last night. On the weather channel Meteo, there was an item about the problem along with a video showing a lady whose legs were covered in bites. That item was followed by one about the rain that affected us yesterday, Orihuela and Bigastro were specifically mentioned – the first time we have heard Bigastro mentioned on national television. Mosquitoes are usually associated with the summer months but of course can breed at any time of year if the conditions are right. They need still water and warm weather. Following the heavy rains there are lots of pools of water left behind which are ideal breeding grounds for these insects. The high temperatures last week proved to be the trigger that set off a breeding frenzy of the mosquitoes that are native to salt lakes. As it happens this species will bite at any time of day and produce a very nasty reaction as hundreds of torreviense will testify. The zones in Torrevieja most affected by the mosquitoes were El Acequión, Torreta Florida, Torreta II and III, Punta de la Víbora, Baños de Europa, Torrealmendros, El Limonar and San Luís. Whereas, the company that are spraying to eradicate the larva and adult insects can work effectively on public property. they have no access to private land. On the affected urbanisations there are bound to be untreated swimming pools or empty pools with just rainwater in them. Even a bucket or a planter with an inch or two of water can become a breeding ground for the larva. Eliminating the current plague of mosquitoes totally is therefore not possible. The cultural program at the the Municipal Auditorium “Francisco Grau” starts this Sunday at 7:30pm with an exchange concert between the Sociedad Unión Musical de Bigastro and the Sociedad Unión Musical de Crevillent. NB These concerts are usually very popular so it is worth getting there in good time to find a seat. Now this is clever. This email, which I have just received purports to come from the Agencia Tributaria and informs me that, according to their calculations, I am due to a tax rebate of €164.50. The rebate will take 10 working days to process once I have clicked on the button which takes me to their site. The web address of the link is so clearly phoney as is the email address they have used. The most obvious clue though is that they don’t know my name. No doubt, if I clicked on the link, they would require my bank details in order to process the rebate and within double quick time I would be penniless. Forget all those bogus scares about Budweiser frog screensavers = this one is for real. If you receive on of these emails treat it like the ones that supposedly come form banks - bin it. 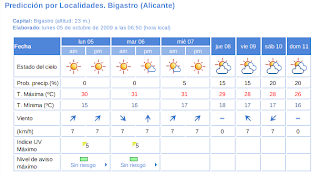 According to the AEMET, the state agency for weather, it is supposed to be sunny with a 5% probability of rain. As I look out of the window it is pouring down. I don’t call that 5%, more like 95%. Could it be that Pam and I have brought the Manchester weather back with us and left Spanish weather there? It was sunny in Manchester when we left, I bet it is still sunny there today. Yes it’s so much nicer to come home. We did have a fabulous time in England but after the ten days we were ready to come home. We miss the sun when we are away. We also miss the tranquillity of our lives. Manchester is so just so busy and we are not used to that. We are used to quiet roads, places to park and shops that are near empty. So we are back – we will return to England soon enough but for the moment it is a return to normality. You do have to pay for a spell of good weather following torrential rain. These conditions are ideal for mosquitoes. Normally the high salt levels prevent the mosquitoes from breeding. However, the heavy rain has reduced the salt levels in the pools around the lagoons thus providing ideal conditions for the Caspius Aedes variety of mosquitoes to breed. The plague of insects has mainly hit Torrevieja, Guardamar and San Miguel. At the hospital in Torrevieja, 18 of the 300 reported cases of people suffering from bites have had to be treated. Three of the cases wee described as very severe and another five were aid to be suffering from acute inflammation in the area of the bites. A fumigation program is now under way to try and eradicate the problem with four teams working hard to kill of both the larvae and he adult insects. Some people love DIY, some do it out of sufferance and others simply hate it. Laura's boyfriend Dave has had very little experience of DIY jobs about the house. However, since they now own their own home, he is now having to get his hands dirty. There were a number of jobs lined up for me to help Dave with on this visit. I think we have covered most and I am sure Dave will finish off the ones we left when he has the time. This is Dave sanding down the bathroom walls. At some point the bottom of the wall had been tiled. Having removed the tiles, the previous owner had not made the walls good. So, having filled in all the bumps and dents for him, I left Dave to sand the walls flat and paint them. Although the paintwork will need a second coat, it already looks a whole lot better than it did. Even though Dave did a very good job, I don't think he will be looking to take up DIY as a hobby just yet! To be honest Pam and I cannot complain about the weather we have had here in Manchester. There have been some rainy spells but there has also been plenty of sunshine. It is actually sunny today, the day we return home to Bigastro. Looking at the forecast for home, Pam will have no problem getting the washing dry and I will have some decent opportunities to give my new camera a bit of a workout. We have had a fantastic time here in England and would like to thank Laura and Dave and Hugh and Angela for looking after us so well. Seeing Pam's father looking so well was a highlight as was meeting up with Joan and BC. I mustn't forget Glenys and Peter who came all the way over from Norfolk to spend the weekend with us and Jemma who came up from Wolverhampton. Thank you to all who made our stay so very special. We look forward to seeing you again in the near future. And now, I have some packing to do! I hate being beaten and very rarely give up on technical problems with my computers. Finally, I managed to install the software to connect a Vodafone dongle to my netbook. Tantalisingly, there was the icon in the Connect section of the desktop on my Acer Inspire One. All I had to do was plug the dongle in and click on the icon and by magic I would be connected to the 3g network. Nope - that did not work. Nor did going to the terminal program and typing in the command line that should have brought the program to life. So the best laid plans as they say have not born fruit as yet. But I have a plan B.
Pam really needs to get into the world of the Internet. She constantly reminds me that she would have no idea how to even start up my desktop machine let alone access our Internet banking. So, out of sheer generosity, I have decided that Pam can use my netbook for this purpose. She likes the netbook and finds it less daunting than my desktop. The interface is simple - just two programs that Pam will use; Mail and Browser. There will be no issues about viruses or Windows updates for Pam to worry about, it will be Internet nirvana. The rub is that I will need to configure the machine for Pam to use by wiping out all the bookmarks that are not relevant and configuring the email program with her email address. That means that the netbook will no longer be set up for me to use. That is where Plan B comes in. I can solve all of my issues with this netbook at a stroke by ordering a Samsung NC 10 with Windows XP upgrading it to 2Gb of RAM. Not only should the Vodafone dongle work but all the tasks I now use the netbook for like photo editing will be a lot easier to perform. Linux is great but Windows is more familiar. It all makes perfect sense to me - now to convince Pam. Now that Laura and Dave are expecting our first grandchild, it was time that we grandparents should meet properly; after all we have a lot to discuss. Although Laura is carrying the baby and Dave is the father, it is from our gene pool that this child will inherit its good looks, its intelligence and its character. No doubt, as the child grows up it will be looking to its grandparents for wisdom, knowledge and most important- finance. Between the four of us, I don't think the child will be sold short on any of those. All the best meetings involve a decent meal. Thankfully, Dave and Laura had booked us in to the Vogue restaurant just round the corner from where they live. They'd never been there so were taking a risk on such an important occasion. As it happened, it was a very good choice. In fact I don't think it could have been better. We had the restaurant to ourselves and so enjoyed the facilities of all of the staff. The hard part at Vogue was choosing what to eat. So many tempting choices from simple dishes to full blown haute cuisine. However, I don't think it much mattered which dish you chose because they were all tasty, well prepared and a delight to the senses. Now to the important stuff. This child needs to grow up to be a true European so we have arranged for the whole family to come over to Bigastro in August to celebrate the Fiesta for San Joaquín. Not only will the child witness the traditions of the town but will also get its first opportunity to listen to the language and savour the aroma of rabbit paella. We may even let it have a dip in the pool as long as it doesn't pee in it. After meeting Joan and BC (as Dave's father is known) I can confidently predict that the two families will get on like a house on fire - as teachers and ex-teachers we have a lot in common. The only issue will be stopping Joan getting to the waiter first to pay the bill. It is a trick she has apparently perfected but it won't work in Spain! Concerned that people are not using their seatbelts when driving round the town, the town council has started a campaign to encourage folks to be more aware of the risks they are taking. I'm not sure how "clunk click every trip" would translate into Spanish. Still ponte el cinturon does have a catchy ring to it. I bought a USB dongle in Asda which I thought would be useful when we are over here in the UK and want a connection to the Internet. The deal was £35 for the dongle including £15 top-up - not bad. Best of all the SIM won't expire if I don't use it for a few months. Now I knew there would not be the software to run a Vodafone dongle under Linpus Linux on my netbook but I was sure that somewhere on the Internet someone would have found a way to do this. Sure enough, there is a site called Betavine which, not only has the software but shows comprehensive instructions to help you install it. It all looked straightforward and was until I tried to complete the installation. Now the Add/Remove program manager stalls trying to find the downloaded package. I can neither connect the dongle nor get back to where I was to try again. It looks like I might have to re install the whole operating system when we get back to Spain and start from scratch. Linux has a lot of virtues - it is free, it takes very few resources and it loads quickly. When it gets screwed up though, it is a bugger. I've brought my netbook over to the Wirral and had hoped that it would simply connect to the wireless network at Hugh and Angela's house. Wrong! Their network is protected with WPA encryption. No problem, all I needed was the password which Andrew gave me. That didn't work so I suspect that Hugh and Angela's oldest son, who set the system up for them may have set up MAC filtering as well. Every network device has a unique address. You can therefore set up a wireless network to only accept connections from those computers with the MAC addresses that you specify. Since the wireless card in my netbook isn't on the list, it is being rejected. I might tbe wrong, but it is possible that is why I can't connect and therefore can't update my Flickr Project 365 until we get back to Sale. We came over from Manchester to the Wirral yesterday. The forecast for rain wasn't wrong, it rained all day only easing off for a few moments now and again. First off we visited Pam's father who we are pleased to report looked very well, better than he had looked the last time Pam visited him. He didn't recognise me aat first and wisely wasn't going to let me into the house. It was only when he saw Pam that he realised who I was. Pam's father is a little confused. For examplw, in the kitchen, he'd poured himself a brandy but was having problems with the top on the Spanish bottle. I showed him how to release the ball inside the pourer by shaking it. With a decent measure in the glass, he then told me he hadn't wanted a brandy. I couldn't drink it because I was driving so he downed it in one. Clearly he is not that confused. It was good to see hjm in such fine spirits though. At 86 years of age, he is doing well and will probably still have a good few years left in him. We hope so because we'd like him to have at least some time with his great grandchild. Now to the gota fria bit. When we arrived at Greasby to visit our friends Hugh, Angela and Andrew, the heavens opened. It very much reminded us of the Monday when we tried to go down to Torrevieja and had to turn back. The only difference was that the drainage system herein Greasby is designed to cope with heavy rain so the roads didn't flood. Just like in Spain, today, following the rain, it is sunny again today. The Valencia government has finally approved a new quota system that will grant thousands of expats, mainly early retirees, access to the public health system here in Spain. Last Friday, September 25, the regional cabinet approved the decree (Decreto 149/2009) that establishes a quarterly payment of 270 euros per person under the age of 65. According to the decree of approval, the new system should come into effect on October 29, a month after its publication in the DOGV official regional bulletin (6112, 29/9/2009). Residents who are currently registered under the old scheme, such as those who have SIP cards with the word 'DEMAND' on them, have 20 days from November 1 to apply to join the new scheme without having to present any supporting documentation (padrón/residence certificate). Any new applicants will also be able to apply from November 1 but will need to present the supporting documentation requested by the Valencia Regional Health Authority. You just knew the mild weather wouldn't last in Manchester. After a few days where the sun broke through on occasions, today it is raining. Thankfully Jemma, Laura and I were able to get most of the DIY jobs that Laura and Dave had lined up for us completed. The new bannister is painted as is the doorstep, the bathroom walls are sanded and filled. We fitted in a few other little jobs as well. Both daughters worked hard putting their old man to shame. Today, Pam and I are off to the Wirral for a few days to see her father and stay with Hugh and Angela. Hugh and Angela live opposite the house we had in Greasby so it is always interesting to go there and see what the new occupants have done to our old home. Quite a lot as it happens such that we hardly recognise it. There is only so much shopping that a man can do. I needed a bag for my new camera and maybe a lightweight coat to wear in Autumn and Spring but that is about it. I'm not one of those "grazing" shoppers who go round looking for things to buy. Yesterday, after brunch, I thought we were going to the coffee shop and then onto B&Q to buy the things we needed for today's DIY projects. I was wrong. There is always another shop that the girls MUST go into and once inside an item that they have to buy. The consequence of this was that by the time we got to B&Q, they had just closed. The job is now delayed. The girls are now watching daytime TV so it could be lunchtime before we get to B&Q and even later before we get started. I hope we don't run out of time to get the jobs done. It looks good for you - a return to summer temperatures and summer sunshine. To be fair it isn't that bad here in Manchester. It is mild and the sun does try and make an appearance for an hour or so each day. Ask anyone who knows the place and they will tell you that it always rains in Manchester. Of course it isn't true; the city has just as many sunny days as anywhere else in the North West. They city does pay tribute to the reputation though as in this passage way between two streets. I don't know how long those umbrellas have been there but they do look well used. Yesterday we went into Manchester to do some shopping. I had forgotten how busy it can get there on Saturdays. It was hard to believe that Britain is currently in the middle of a recession. First stop, the Slug and Lettuce bar/restaurant for lunch; then Marks and Spencer. I didn't do very well at Marks, only finding one of the three items on my list. Pam fared much better finding several tops that she just had to have. We men then went off to find a bag for my new camera whilst the ladies continued to search Marks and Spencer followed by Jemma's favourite shop, Primark. We men had accomplished all that we set out to do a lot faster than the women which bought us time for a drink in one of the pubs near the Manchester Eye. Following our shopping trip, the plan was to go to the Hilton for cocktails. They only allow so many people in at once to the cocktail bar, so you have to queue and wait. With tired feet and weary from so much shopping, we decided to visit a nearby tavern instead - a good choice. A round of cocktails in the Hilton would have cost over £50. As it was a round in the pub came to an unbelievable £25. Suitably refreshed, we made our way to El Rincon de Rafa, a Spanish tapas bar in the heart of the city. For the benefit of my Spanish readers, I can tell you that tapas are even more popular in Manchester than they are in Spain. Luckily, Dave had booked us a table otherwise we would have had to have eaten at the bar. The range and the quality of tapas were excellent- well up to the standards that we enjoy in Bigastro. Dave, the boyfriend of our youngest daughter Laura, was very taken with the crab claws so he ordered a second ration and wanted me to post this picture of the left overs. As some of you will know, Pam and I are visiting the girls this week. That means we have swapped the sun of Spain for the rain of Manchester and I have my two hours of peace to write my blog for the chaos of family life. If I can grab some time, I'll try and find a story or two for you. In the meantime, I have been summoned to the kitchen FOUR TIMES to do the washing up. Isn’t it good to see a weather map of Spain with sun symbols again? The heavy rain wasn’t all bad though. The volume of water in the river Segura has improved. With half the annual amount of rain in just a few days that was inevitable. Winter crops of broccolis, potatoes and artichokes in the kitchen gardens may have been damaged by the rain but overall the land will have benefited because the salts and other pollutants have now been washed away. This leaching of he soil will improve both the quantity and quality of crops produced next year especially the citrus fruits. In 2003, a plan was set out to reduce the effects of flooding in the Valencian region. There were to be 151 projects with the Valencian Government undertaking 85 of them, the Hydrographical Confederation of Júcar 20, 13 were to be joint projects and 33 were to be carried out by city councils. The Valencian Autonomous Government has only completed 18 of their projects, the CHJ has done better completing 60% of the work it set out.There are so many outstanding projects that it is not surprising the latest rains have caused chaos, flooding and misery for people. Although the centre of Alicante is now well protected against flooding, there are zones which still suffer when the rain is heavy. On parts of the Orihuela coast rain water and sewerage share the same drainage system so you can imagine what problems that causes. The CV 905 into Torrevieja is a nightmare. Even the motorways suffer and have to be closed in sections. The problem is, that for over 90 percent of the time, the drainage systems just sit there, dry as a bone doing nothing. It is only when the conditions are extreme that they get tested. Then the flaws in design, the inadequacy of the measures taken and the failure of maintenance become apparent. Everyone hopes there will not be a repeat of the 1997 storm that caused so much damage but the truth is, with global warming, there is every possibility of similar if not even worse storms in the future and the area is not prepared for that. City planning pressure, over urbanisation and lack of planning for drainage systems have all contributed to the situation. Now, the area is paying the price for that lack of foresight. It isn’t just the road network that is badly protected, many of the buildings are unable to cope with the intense storms especially those with flat roofs. At the dentist’s,where we visited yesterday, they had water seeping in to the electric panel. In order to keep operating, they had to constantly try and dry out the panel; resetting the trips whenever they cut the supply out. In MacDonalds they had water coming in through the ceiling above the tills. Half the tills were covered with plastic bags to protect them and one of the assistants was constantly mopping up to keep the area safe.